I am a big fan of demonstrator type fountain pens (mostly because when you change your ink, it's like having a brand new pen) and most of mine are very inexpensive Chinese offerings - cheap and cheerful. The pen that arrived at the end of last week is the Divine Design Eye-Dropper pen. This retails for about 33 Euros and its unique selling point is that it comes with three filling options. Surely it can take a cartridge *crosses self* if you really have to, but it also comes with a convertor and, wait for it, it can be used as an eye-dropper fountain pen (syringe included with the pen too - which is great). I guess the clue was in the name, Divine Design Eye Dropper Fountain Pen, ammi right? Anyway, the barrel is capacious (4ml) and I reckon that if you filled it with ink you could get through all your thesis writing for the year on one barrel alone. I like to switch it up a bit, so I just filled the convertor - I get bored with inks and like to have a few different shades on the go at the same time. Here I've filled it with Beaufort Ink's Zodiac Blue. I am still not David Bailey, despite my best efforts. I'm also a bit wary of putting ink straight into a pen barrel. I am terrified of ink-related wardrobe malfunctions or, worse, getting it all over a carpet or bit of furniture. And with my luck it would be someone's antique Persian heirloom or hugely valuable chair that my leaky eyedropper would choose to expire upon. That fear aside, it does feel as if the barrel screws securely to the section, but I'd probably want to run a wee bit of silicon around the inside just to keep the ink where it ought to be. A black presentation box that includes the pen, the convertor and the syringe, all nice and snug. There is also an instruction sheet. Although the instructions are not in English, you can work out what's what with the pen, no trouble. The cap is black with chrome trim - including a clip. Inside the cap there is a spring that provides pleasant resistance when you are screwing the cap on and lets the cap pop off when you are unscrewing. The cap doesn't REALLY post onto the pen. Not securely at any rate. And I like my pen caps to post. Otherwise it's just something else to have to keep tabs on. The 33 Euro price of the pen on the fpnibs.com site is WITHOUT a nib. They have a huge variety of nibs to choose from and this particular one was fitted with a suitably divine No 6 Jowo medium nib in purple lacquer which makes for a smoooooooth and li'l bit wet writing experience - which I found very soothing. This nib would add about 18 Euros to the pen price, so bear that in mind. 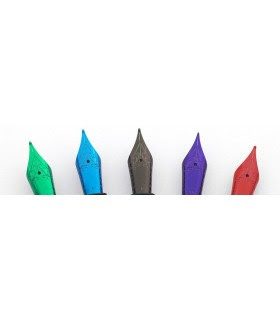 Check out fpnibs.com for their full range of lacquered nib - gorgeous colours! Weird photo with lots of white space. Lacquered nibs! I like this pen - with this nib. Would I like it with a Divine Design iridium standard nib? I don't know. But with this nib, it's a great writing experience with a large capacity pen that offers multiple ink options. If this is all to spendy for you, there is a similar pen (the 'Polo') available in a variety of brightly coloured trim finishes (without the converters etc) if you fancy something more funky that costs hardly any shekels at all. Try the DD for yourself!